This is a Roland Bee Baa Fuzz. 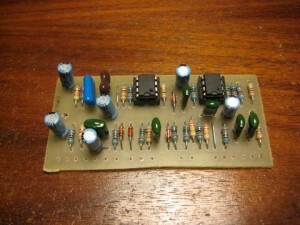 It’s sort of a booster followed by a two transistor silicon fuzz. The sounds is pretty heavy and doom like. Interpret that how you will. 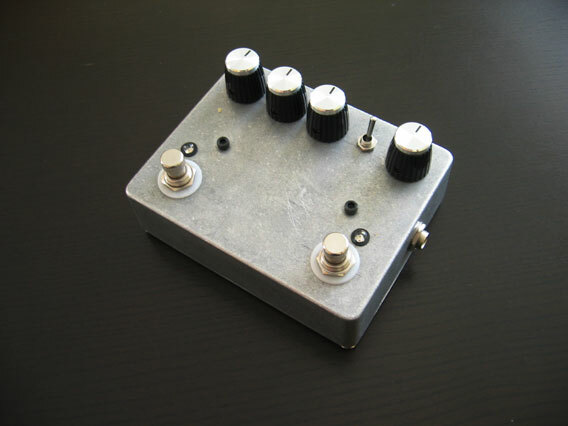 The original came in a larger case with three stomp switches on top, bypass, boost, tone. I used stomp switches for the boost and bypass, and use a toggle for the tone switch. I built this from the GEOFEX layout. The mighty roar of this pedal demanded more than than puny plastic standoffs could hold. Wussy adhesive backing would not be enough. I chose to go with 440 allen bolts and aluminum standoffs to secure the PCB to the enclosure.